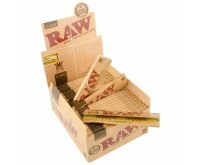 With a wide range of long rolling papers, you are at the right place at Dutch-Headshop. 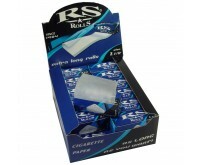 Buy all sorts of rolling papers here, in a small package or in king-size discount sets. Choose your favorite long rolling papers at the Dutch-Headshop. The Dutch-Headshop has a wide range of different types and sizes of rolling paper for rolling joints. 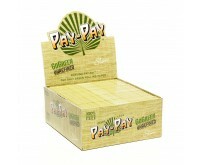 With long rolling papers you quickly think of a pack of rolling papers. These small packages are of course available here, but the Dutch-Headshop has discount packs, boxes and rolling paper on a roll as well. When purchasing a discount set or a box, you will of course save money and you will have enough rolling paper at home for a long time. This way you ensure you don't miss rolling papers when you want to roll a joint. Rolling paper on a roll is handy if you want to determine the size of the joint yourself. You can roll a small spliff, or an enormous joint. Long rolling papers come in many shapes and sizes. The size of a joint is very important for smoking a joint, as this determines how much weed or hash it can contain. Therefore, there are many sizes available. The length and width differs per rolling paper. You can choose between medium size, king size and extra large rolling papers. Long rolling papers ensure it's easy to roll your joint and smoke it. Long rolling papers are made of unbleached, ultra-thin rolling papers and the sticky edge is often made of natural gum. The rolling paper is therefore of high quality. The packages ensure protection of the papers, so they won't crease or tear. There are many brands, each with their own qualities and benefits. All rolling paper brands are shown below. The best-known brands are Smoking and Futurola. The offer of these famous brands is therefore also the largest at the Dutch-Headshop. Smoking produces rolling papers since 1879, and this rolling paper is produced by Miguel Y Costas & Miguel SA from Barcelona. 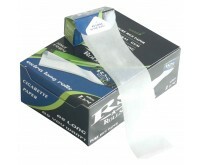 Smoking is known for its quality rolling papers that are very pleasant to smoke. Futurola rolling paper is produced by Futurola's founders from Amsterdam. 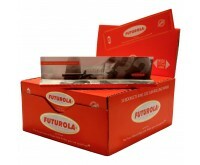 Futurola rolling paper is made of rice paper and is very nice to smoke as well. Futurola has, besides long rolling papers, also tips and a discount set with rolling papers, tip booklets and joint sleeves. Don't bother going to the store, order your favorite long rolling papers easily and discretely online at Dutch-Headshop.